Imagine walking down a flower lined pathway, across a little bridge over a tranquil pool of water. Can you see it? Do you smell the aroma of fresh-cut grass and flowers? Awesome now you’re here! Welcome to the Canada area in Disney’s EPCOT Center. A place full of wonderful architecture and beauty that I can never spend enough time at. 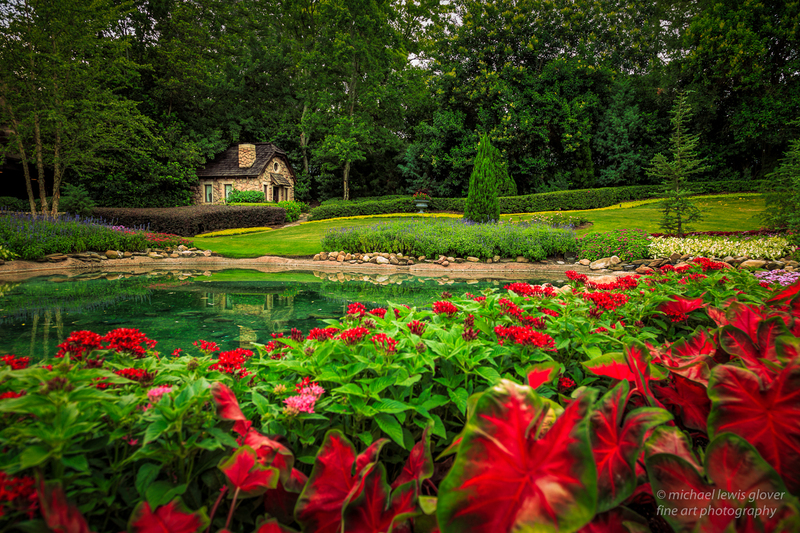 This scene greets visitors on their way to a premier dining destination known as Le Cellier Steakhouse. This quaint little cottage caught my eye so I decided to set up for a shot. I got down low so I could include the reflection in the water and get the Caladiums up close that were right in front of me. I felt like I was looking at a painting. Even though there were other people around I zoned out into the peacefulness of the moment. Although I have not been to Canada yet, I am planning on visiting someday. I can imagine this is what it would look like from some of the pictures I’ve seen. They have a 360 degree theater with a film about different areas in Canada called O Canada! I’ve seen it a couple of times and it is very enjoyable. 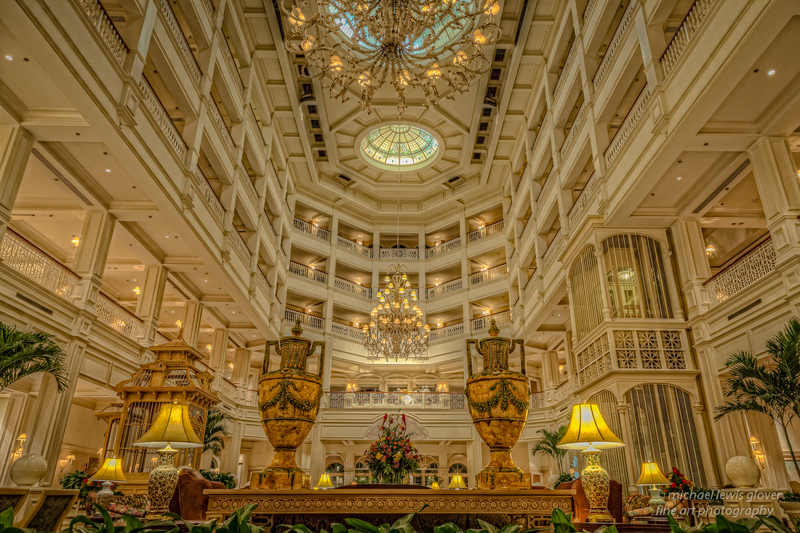 Welcome to Disney’s Grand Floridian Resort and Spa! 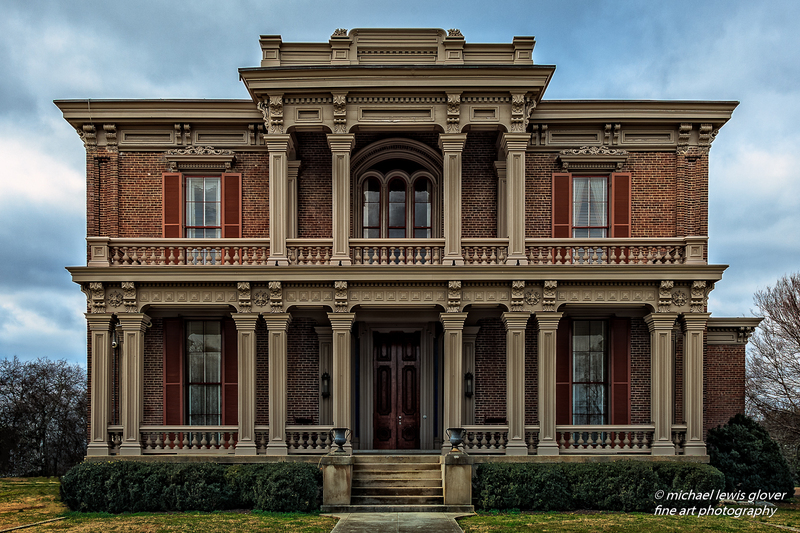 The architectural design of this place is a true marvel. On a recent visit to this spectacular hotel, I decided to wait around til later in the evening, hoping to capture some images without people. At 11:00 on a Sunday night, just about everyone had retired to their rooms after a full day of fun. I only had to wait a couple of minutes to get my shots. I love all of the details they put into the layout like the massive birdcage on the left or the giant urns on the table in front of me. And the lighting is unrivaled with those magnificent chandeliers! On the second floor in the back they have a band that plays a very nice variety of music throughout the day. For this shot I setup my tripod down low to try and get as much in the frame as I could. 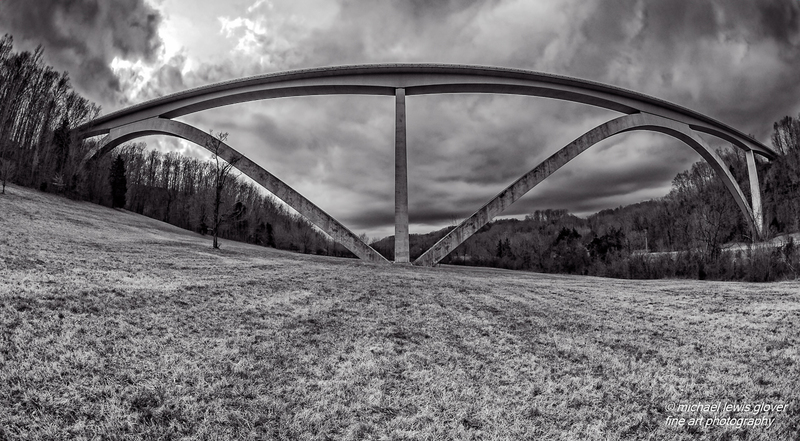 Capturing the grand scale in a photo is almost impossible. In honor of Valentine’s Day, today’s post features a wedding gazebo with intricately cut hearts around the top. 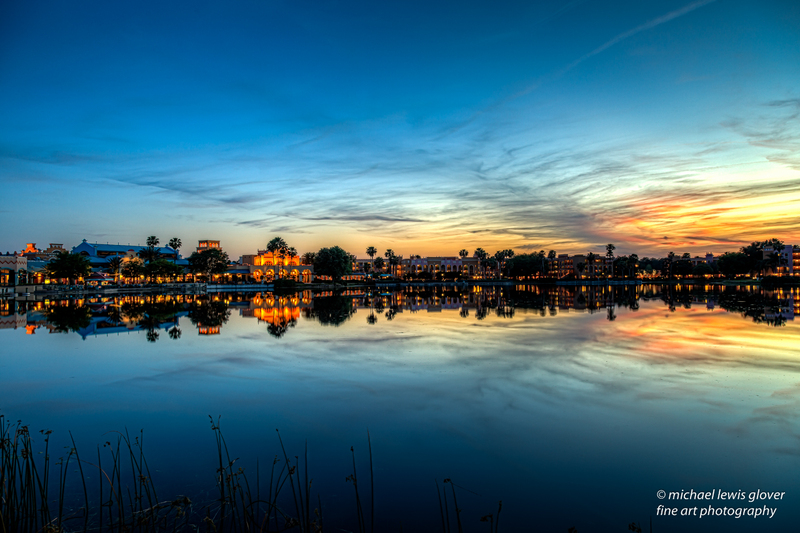 Disney’s Boardwalk area is the setting for this image. 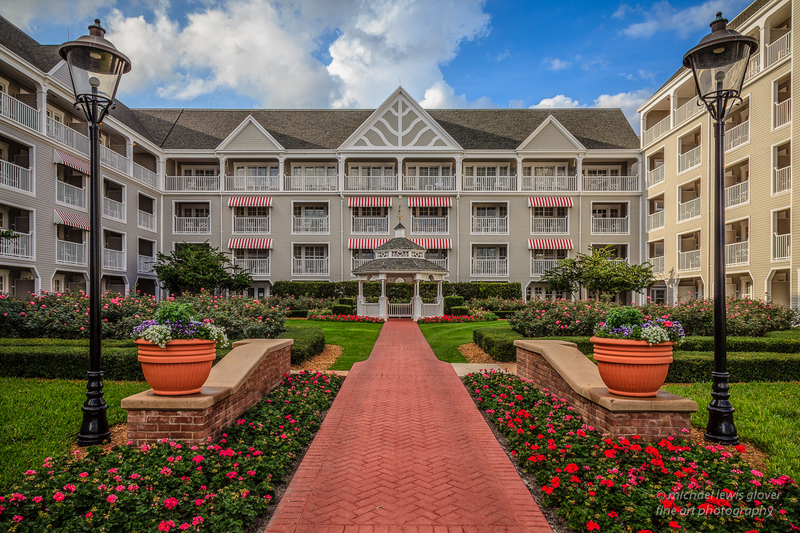 A flower lined brick pathway leads to the gazebo with Disney’s Yacht Club Resort creating the perfect backdrop. I felt like I was walking into a painting. The lighting was perfect with the right mix of sun and clouds. 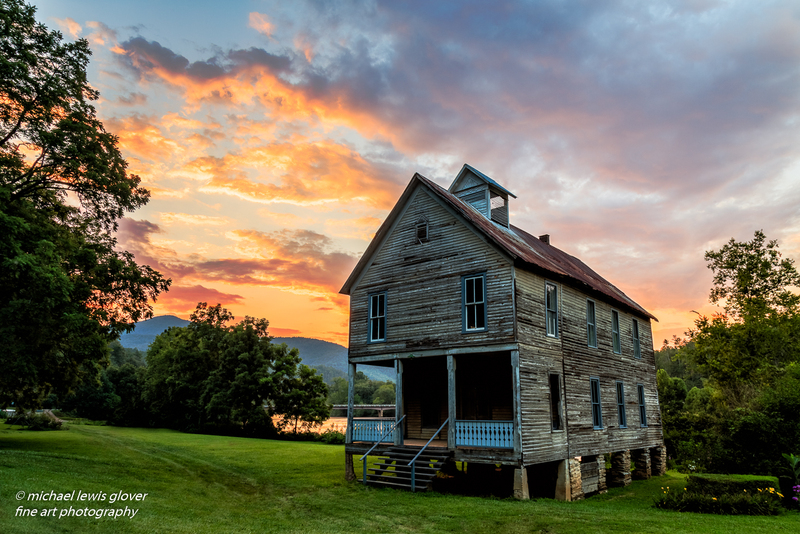 All of the magnificent color was what initially drew my eye to this scene. After that it was just a matter of framing up all of the elements I liked. The lamp-posts and the flower pots seemed to add just the right amount of decor to an already eye pleasing scene. The vibrant colors of the flowers and the awnings completed the picture.